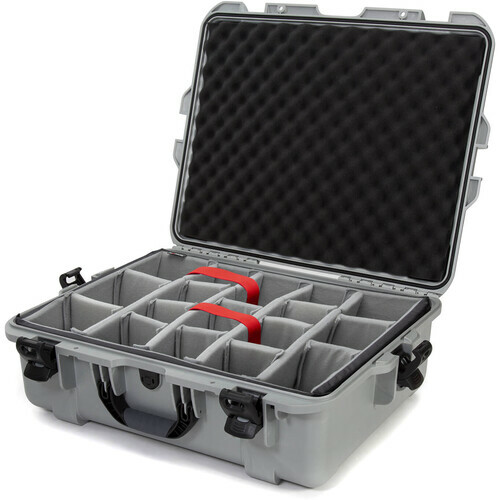 Store, protect, and transport your valuable photo, electronic, or other gear with the waterproof and dustproof silver 945 Case with Padded Dividers from NANUK. The case features a removable padded insert with touch-fastening dividers, and a foam piece for the inner lid. PowerClaw latches and holes for optional user-supplied padlocks provide secure closure. Users will appreciate the strong NK-7 resin construction, automatic pressure release valve, integrated lid stay, and large, folding, soft-grip handle. The 945 case is stackable with same-size cases. Box Dimensions (LxWxH) 25.0 x 20.5 x 9.5"
945 Case with Padded Dividers (Silver) is rated 5.0 out of 5 by 3. Rated 5 out of 5 by Grondona from excellant case. I ordered this case to protect my cameras and lenses.The case is very well made and does what I needed. The only issue I have is the case is just too small for all my body's & lenses ect. I now will have to order a second case, to store all of my equipment safely.I would like Nanuk to make a larger case for us photographers that admittedly, have too much equipment for one case to hold.Even having to obtain a second case it will be less expensive, then ordering a very large pelican case with dividers. Rated 5 out of 5 by PBG from Great case Great when travelling with my camera on boats, in cars and more. I dont have to be afraid about my gear. Rated 5 out of 5 by David from This is a great case and an unexpected value for the money. Multi purpose case for my lights and lenses. The adjustable compartments are spectacular. what is the size of the case - I am looking for 12 x 17 -? Answered by: Petur Bjarni G.